Ten years ago, it took a fairly powerful computer in order to edit video, but now you can do everything on your iPhone or iPad. Provided you have the right tools at your disposal, shooting, processing, and editing your masterpiece with iOS is an increasingly valid option. We’ve talked about getting better video from your smartphone Smartphone Spielberg: How To Shoot Striking Videos on Your Mobile Smartphone Spielberg: How To Shoot Striking Videos on Your Mobile The best camera you can possibly lay your hands on is the one that you currently have on you, or so the saying goes. Ever since hardware manufacturers started putting bigger and better cameras on... Read More before and even took a look at some of the accessories that can help Better iPhone Audio & Video: Adapters, Microphones And Accessories For Superior Sound [iPhone] Better iPhone Audio & Video: Adapters, Microphones And Accessories For Superior Sound [iPhone] Last week I rounded up a few of the best apps for capturing video and the accessories you might want to consider if you want to get the most out of your iPhone’s video capabilities.... Read More , so now it’s time to see what iOS has to offer once your production moves into the post-production phase. In all likelihood, the video you will end up editing on your iPad or iPhone also originated on an iOS device. In such instances, it’s useful to quickly trim files down to size before transferring them all to the same device for editing. I’d recommend using AirDop Share Files Easily Between Computers With AirDrop & Two Similar Applications [Mac] Share Files Easily Between Computers With AirDrop & Two Similar Applications [Mac] How often have you sent an email to yourself, simply to move a picture or document between computers? Often, the only obvious alternative is clear overkill, like setting up a temporary FTP server on your... Read More for this, which provides fast transfer for large files between iOS devices. If you’re not using an iPhone or another iPad as the source, you might want to use other methods, like iTunes File Sharing to share directly with the application of your choice. Collating footage, organising rushes, and storyboarding are important parts of the traditional video editing workflow anyway, so try to integrate this stage into your own. If quality is something you’re aiming for, FiLMIC Pro ($4.99) is the best iOS app for capturing high definition video. Shoot at 1080p with framerates of 24p or 25p and vastly improved bitrates when compared with the stock Camera app. If you own both an iPhone and an iPad you can use FiLMiC Remote ($4.99) for a live preview of what’s on screen. Unfortunately, there aren’t many complete video editing packages for iOS — the App Store is instead flooded with “automatic” editors and slideshow creators which provide very little fine-control over your resulting production. That said, there are a few highly capable video editors that give the desktop solutions The 8 Best Free Video Editors for Mac The 8 Best Free Video Editors for Mac Need to edit video on a budget? These free Mac video editors let you perform essential video editing tasks at no cost. Read More a run for their money without requiring tertiary qualifications to know how to use. Apple develops two video editors, one is called Final Cut and the other is this one: iMovie. Despite shipping for free with every Mac, Apple still charges a token $5 for its iOS version — a bargain considering what you get for your money. Not only is the app designed with complete user-friendliness in mind, meaning it’s usable even if you’ve never edited a video before in your life, it’s also packed with features. Choose your video from the reel, trim and slice it up as you see fit, then apply one of eight themes to instantly pair your production with matching titles, transitions, and music. A variety of special effects like picture-in-picture, slow motion, and split-screen are all easy to apply, and you can even do away with themes in favour of your own custom transitions, music, and titles. Once you’ve finished your masterpiece, you can automatically create a Hollywood-style trailer complete with customised credits, motion graphics, and music. Then share your project via email or Messages, publish to YouTube, Vimeo, and Facebook, or pass on your editable iMovie projects in their entirety via AirDrop to a friend. 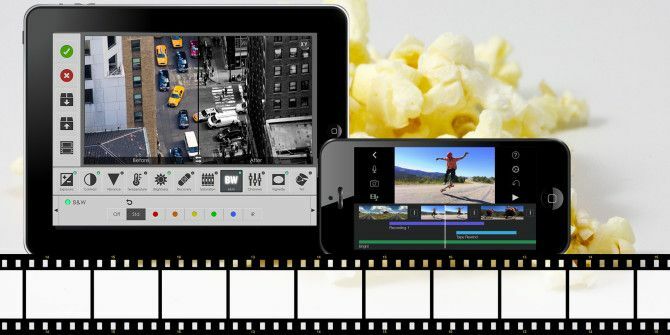 If you want to use your phone and tablet for video purposes, iMovie is a great starting point. Does iMovie feel a bit limiting to you? There’s a good chance you’re looking for a more advanced video editor to rival some of the non-linear desktop applications out there. Luckily, Corel spotted the gap in the market and produced Pinnacle Studio, a more powerful video editor that’s designed to be fine for hobbyists, but powerful enough for the pro. A brief glance at the interface and you’ll notice that the app looks a lot more like traditional desktop editing software than iMovie does. Pinnacle Studio lets you access external media via Apple’s Camera Connection Kit ($39), cloud storage locations like Dropbox and Google Drive (you’ll need the $4.99 in-app purchase), or simply whatever video is on your device. Pinnacle Studio provides user-friendliness when you want it, while delivering some more powerful features like custom motion titles and graphics, proper 1080p output, audio editing features, and “Montage” templates for multi-layer 3D animations and transitions. It’s probably the best iPad video editor from an advanced features standpoint. Did neither of the other two tickle your fancy? Well don’t get your hopes too high, Videoshop isn’t exactly full-featured. The video editor focuses on speed rather than features or functionality. That said, it’s about as easy to use as Instagram and allows you to export your creations straight to the likes of Vine and Instagram among others. 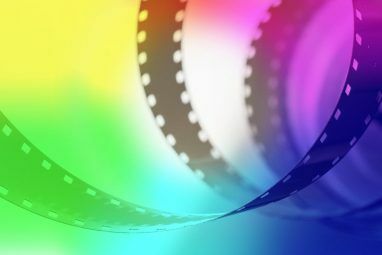 Videoshop uses filters and themes, though you can choose to omit the gaudy stylization and simply use it as a means of splicing and combining your clips together. The app doesn’t have any in-app purchases, which means you get access to all of the features for one low price. Add music and sound-effects, adjust playback speed, and export to your Camera Roll, YouTube, Facebook, and others in maximum 720p resolution. While these tools will help you edit your finished production together, you might need a helping hand along the way with effects and titles, which is where these apps come in. http://vimeo.com/63003072 Considering the price, VideoGrade is one of the most astounding apps on the App Store. Colour-grading is the act of tinting and stylising video, with professional grading software like Magic Bullet Looks starting at $399 and running into the thousands for more advanced solutions. Now you can have a small slice of the colour-grading action for a fraction of the price. The results are startlingly good, and the app itself is robust. Create your own presets then save them for use throughout your footage, or simply use a few tweaks to rescue a shot. Change parameters like exposure, contrast, and temperature while desaturating for moody black and white shots before previewing your changes and exporting your clips at 1080p. http://vimeo.com/73010012 Just like VideoGrade above, Chromic is a colour-grading app that allows you to quickly stylise your video. Unlike VideoGrade, Chromic doesn’t provide sliders for you to play with, instead taking the same route as Instagram by opting to use filters. There are 62 in total, spread across six sets, only eight of which are included for free — you’ll need to purchase the rest. For the same price as VideoGrade ($4.99), you can unlock every filter within the app and choose from film, vintage, pastel, and monotone presets, among others. Just like VideoGrade, the app provides full previews of the effects before you apply them. Chromic exports your videos in the same format they were imported in, which means the app has full support for 1080p in and out. http://vimeo.com/78047976 Gravie is an app designed to do one thing — overlay text and graphics on top of your clips. Whether you need a title card, credits sequence, some cutaways, or you want to make a point on social networks like Vine, Gravie can help. 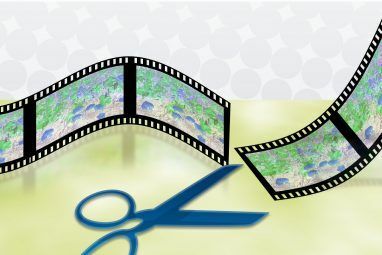 The app makes everything easy by providing eight themes consisting of 91 unique templates, which can be edited to fit your video. Modify colour, add text, customise fonts or use one of 12 transitions to make your titles and credits even better than what Pinnacle Studio or iMovie can achieve. These apps should take your iOS-powered productions to the next level. The lack of a seriously professional-level video editors is probably down to the nature of the iPad’s touchscreen input: it’s just not as good as a mouse and keyboard setup. If you’ve used Final Cut or Adobe Premier for longer than a few hours, you’ll appreciate the depth within and their utter reliance on keyboard input, and it might be a while before we see anything that comes close on the mobile platform. What video apps do you use on your iPhone or iPad? I’ve probably missed something, so add it the comments below. Explore more about: Filmmaking, Video Editor. Perfect Video, in my opinion beats anything I've tried. The pro version is inexpensive. And developer support is superb, I've had immediate responses regularly. Can anyone help me transfer songs from my iPhone to my iMac?